It will be love at first sight when you surprise the kids with these fun Valentine’s Day treats and eats. 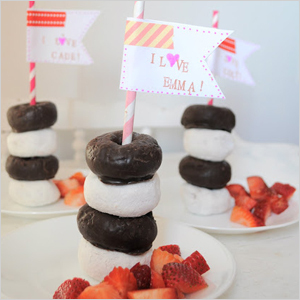 Surprise the kids after school with a tower of love — stacked mini doughnuts, complete with a striped paper straw and washi tape flag. Don’t forget a side of strawberries! 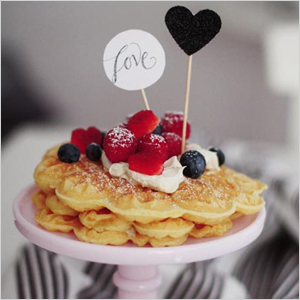 Fluffy waffles look extra sweet stacked on a mini pedestal cake stand and topped with fresh whipped cream and berries. Buy a heart waffle maker and profess your love with waffles all year long. Skip the food coloring and “pink” your drink the old-fashioned way — with strawberries. 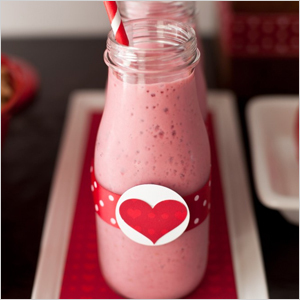 This strawberry almond smoothie recipe would be perfect for a Valentine’s Day breakfast. 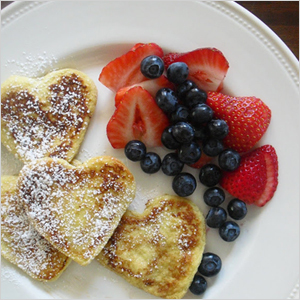 Nothing says love like heart-shaped pancakes. Don’t have a heart-shaped pancake mold? No problem. 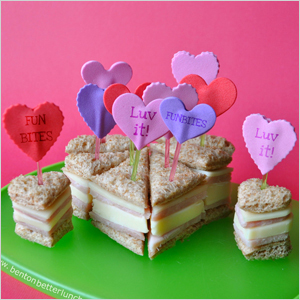 Check out this tutorial on how to make DIY aluminum foil molds for your heart cakes. Gluten-free? Try Love Grain Pancake + Waffle Mix, made with teff, an ancient grain with a mild nutty flavor that’s rich in calcium, protein and fiber. 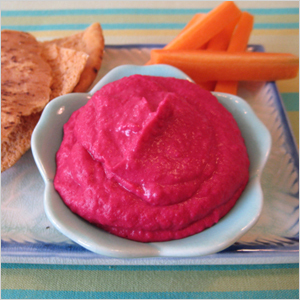 Smooth and creamy, this hummus dip gets its brilliant color from a roasted beet. Serve with pita chips and veggies and watch the kids gobble it up. These healthy crackers get their orange color from extra-sharp cheddar and sweet potato purée. 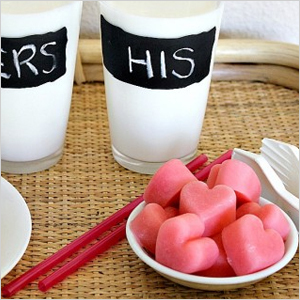 These adorable pink hearts are made by freezing strawberry milk in a heart-shaped ice cube mold. Ikea, here we come. Use cookie cutters and toothpick flags to turn a ho-hum ham and cheese sandwich into something special. This one was made with a FunBites hearts cutter. They’re red. They’re sweet. They’re fun to eat. 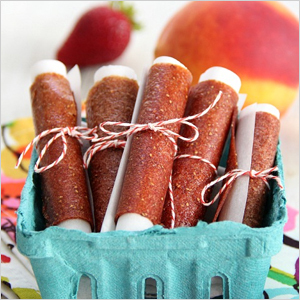 We can’t think of a kid who wouldn’t want to open his lunch box to find homemade strawberry-peach fruit leather. The ingredients? Fruit and agave nectar — that’s it. 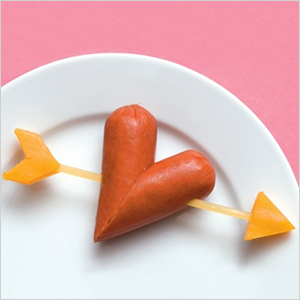 Play Cupid and serve your valentines a fun little hot dog heart. Simply cut the ends from a hot dog on the diagonal, spear with a piece of uncooked linguini and add cheese bits to form the ends of an arrow. 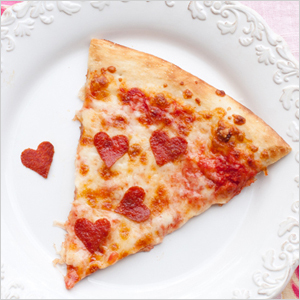 Add a little love to your store-bought pie with heart-shaped pepperoni. 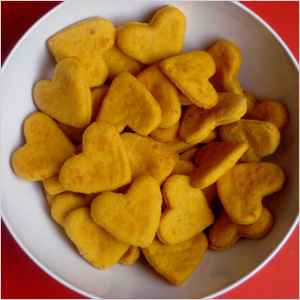 Pick up a package of sliced pepperoni and use a cookie cutter to cut out heart shapes. Top the pizza with “meat hearts” before baking. 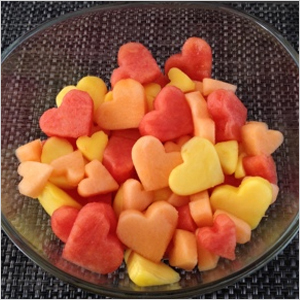 Use two sizes of cookie cutters to stamp out watermelon, cantaloupe and pineapple fruit hearts. Serve with toothpicks and individual yogurt or chocolate dips for a fun snack or dessert. 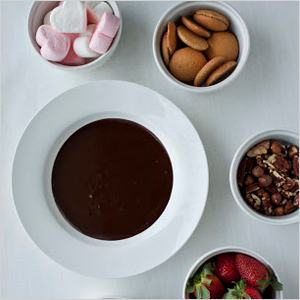 If your kids like to dip, they’ll love celebrating Valentine’s Day with a family fondue night. Start off with cheese fondue served with a variety of meats, veggies and ravioli. Follow up with chocolate-dipped fruits, nuts and sweet treats. 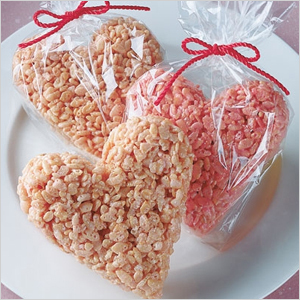 Heart cookie cutters and a touch of food coloring turn Rice Krispies and marshmallows into an extra-special Valentine’s Day treat.